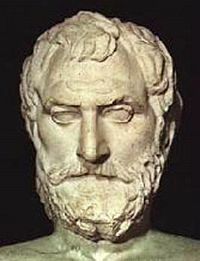 Thales (in Greek: Θαλης) of Miletus (ca. 624 – 546 B.C.E. ), also known as Thales the Milesian, was a pre-Socratic Greek philosopher and one of the Seven Sages of Greece. Since Aristotle credited him with being the first philosopher (Metaphysics 983b6), Thales has been known to be the first representative of Western philosophy. Contrary to polytheistic Greek mythology, which ascribed social and natural phenomena to the arbitrary will, tricks, anger, and jealousy of the gods, Thales tried to explain these phenomena based upon unchanging principles. His dramatic quest for the principle that could uniformly explain all phenomena had the potential to free people from superstitious beliefs. By opening this new perspective, Thales prepared the way for subsequent pre-Socratic philosophers to pursue fundamental principles in their own way. By thus breaking the framework of Greek mythology and speculative beliefs of his day, Thales opened a new ground for the pursuit of truth. Aristotle’s recognition of Thales as the first philosopher rests on this perspective of inquiring for unchanging, unifying principles. The significance of Thales lies not in his particular cosmology but in his way of inquiry. Thales lived in the city of Miletus, in Ionia, now western Turkey. According to Herodotus, he was of Phoenician descent. It was said that Thales had no children but adopted his nephew as his son. The well-traveled Ionians had many dealings with Egypt and Babylon, and Thales may have had exposure to Egyptian mythology, astronomy, and mathematics, as well as to other traditions foreign to the Homeric traditions of Greece. Proclus, a fifth-century C.E. philosopher, noted Thales’ exposure to Egyptian geometry. The discovery of several geometrical theorems was also credited to him. Herodotus, a fifth-century B.C.E. historian, recorded Thales’ prediction of a solar eclipse that put an end of the battle between King Alyattes of Lydia and King Cyaxares of Media. Both Xenophanes and Diogenes Laertius also noted this event. One story recounts that he bought all the olive presses in Miletus after predicting the weather and a good harvest for a particular year. Another version of this same story states that he bought the presses to demonstrate to his fellow Milesians that he could use his intelligence to enrich himself. Herodotus recorded that Thales advised the city-states of Ionia to form a federation. Various sayings, discoveries, and accomplishments have been ascribed to him, but their authenticity is uncertain. As is the case with other wise men, Thales probably had a broad knowledge in diverse areas, such as mathematics, astronomy, meteorology, politics, and others. Thales ascribed ultimate being to water. Within the framework of the ontology of form and matter, Aristotle interpreted him as a predecessor who had discovered a material cause of being. Based upon Aristotle’s interpretation, Thales is often characterized as a natural philosopher. Like other pre-Socratic philosophers, however, his concept of material has mythical connotations. Aristotle noted Thales’ word “All things are filled with gods” (On the Soul 411a7). The phrase indicates that Thales’ cosmology has mystical elements and “water” should not be interpreted as a pure material in a modern sense. Thales’ philosophy can be characterized as a “philosophy of life” (water, development), and his concept of water should be interpreted within this framework. Thales seems to have maintained the reality of souls in beings such as the entire cosmos and individual things in nature. Diogenes Laertius also notes Thales' view of the immortality of the soul. Here we can thus find the indication of an incipient form of dual characteristics of internal character (soul) and external form (body), a view which was developed by subsequent thinkers. This idea of Thales is implicitly described by Aristotle (De Anima A5411a7). His writings only survive in fragmentary quotes and passages in the works of other authors. No text contains Thales’ own views: what he meant by “water” and why he thought that it is the ultimate remains unclear. We can only speculate about the likely reasoning of Thales: that water is vital to life and nourishes living organisms; Thales thought that the Earth existed as a mass that floats on water (Aristotle, Metaphysics 983b21; On the Heaven 294a28); water can change from and to vapor, liquid, and ice; water circulates in the entire natural world; water is used in religious rituals for purification and other uses. The origin of these ideas can be traced back to various traditions of his time. The idea that the Earth is floating on water, for example, existed in Egyptian traditions. The vital importance of water was commonly recognized. We can speculate that Thales developed his thought based upon these ideas. This page was last modified on 23 November 2015, at 16:06.